"Detect and delete efficiently all kind of spyware." 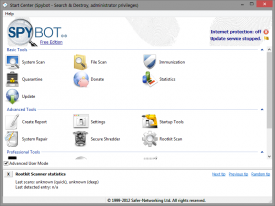 SpyBot Search & Destroy detects and deletes almost a billion of different kinds of spyware which, in many cases not considered as a virus, can cause much more destruction. It also detects incorrect registry entries and deals with them one by one. It has a basic and simple mode and the other more advanced for users with experience who want to modify and check specific things, but in general the basic mode is enough for cleaning the system and protect it from the future threats. The basic tools consist of a system scanner which analizes the files of the system and searches for malware and incongruity produces by obsolete entries in the registry, generally when uninstalling incorrectly some program. It also has a file scanner which looks for spyware or malware on the hard drive. In case it finds something it deletes it and sends it to quarantine zone (an isolated folder where all the malicious files are sent to) and will block them depending on the settings of the user. Another very useful mode is “immunity”, which is a set of rules and settings which make that in the future certain types of spyware or malware can’t infect computer, either via cookies or spyware located in certain folders or registry entries for example. Apart from the advanced mode we can see and modify the programs that start up together with Windows, a method used by malicious software for infecting and autorunning. 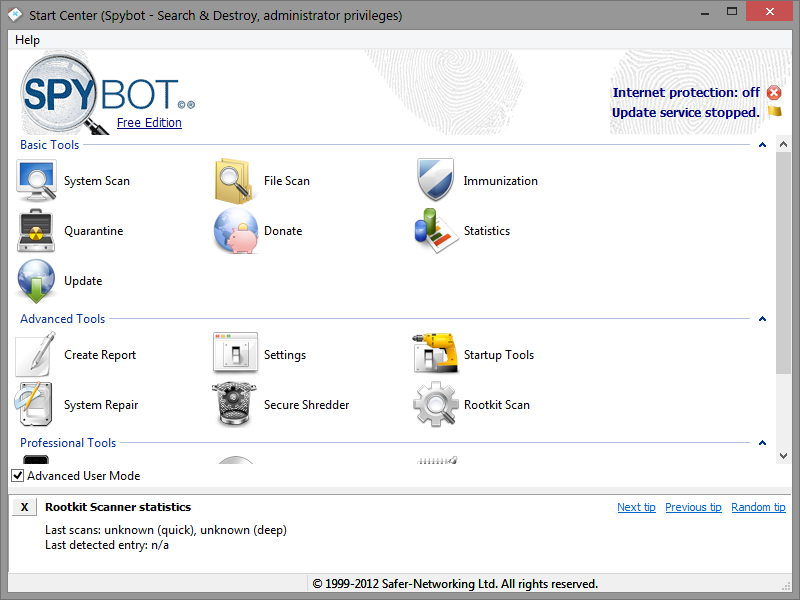 By downloading SpyBot Search & Destroy we make sure that our computer will be clean and protected from future threats. Anyways, it is recommendable to have an antivirus software for avoiding threats of other dangerous software.